Here is a summary of the records in 2019, and scroll down the page to see results from the last four years. With the increased number of records we can start to see some fascinating changes in the flight periods from year to year. In 2016 the flight period was quite extended, with a low peak in mid-April. In 2017 warm weather early on meant that the flight period started very early, peaked in early April and ended earlier as well. In 2018 it was a later start again, with a very sharp peak in mid-April and a scattering of records into late June. In 2019 our first record was the earliest ever, on 24 February, so it will be fascinating to see how this plays out. And I would love to know more about the late season records. We get reports into July and August but usually they cannot be confirmed. And even in June we don't really know whether people are seeing late-surviving individuals or a partial second brood. If you see a bee-fly after mid-June please do try to get a photo, we know that some reports from late in the season have turned out to be Humming-bird Hawk-moths or other misidentifications. 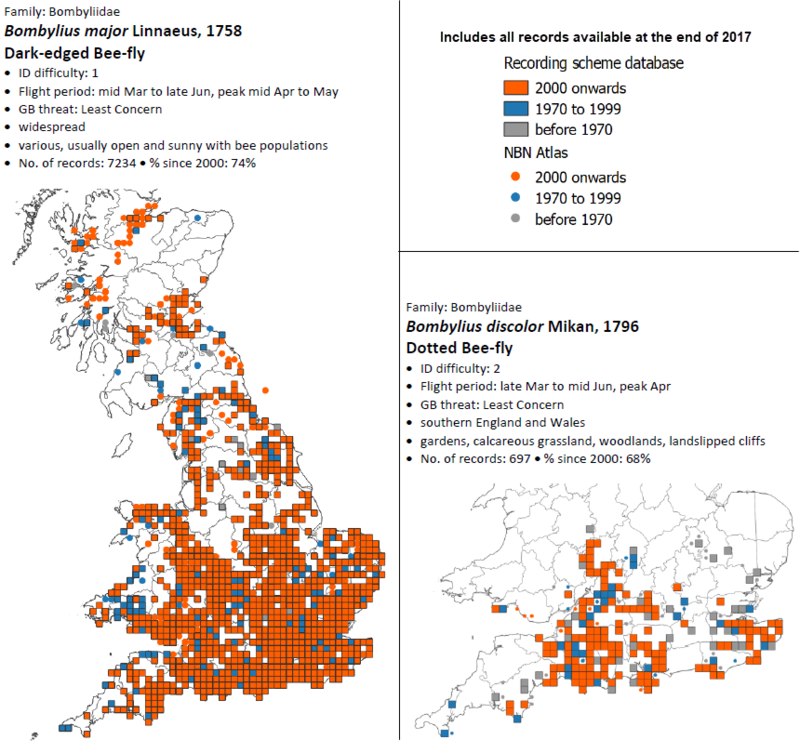 Is Dark-edged Bee-fly really so thin on the ground in western areas of Wales and England? How widespread is it really in Scotland - are the recent records signs of a spread or just more people sending in records? 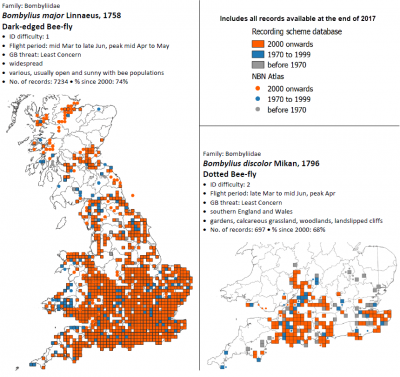 Will Dotted Bee-fly continue spreading through the midlands and be able to recolonise East Anglia?